it's almost the middle of july and i've been pondering how i've been doing with regard to those things i set out on my art journal page back in june. on tuesday, i managed to go into copenhagen without my camera, so i've failed on that whole "never leave the house without my camera." i still haven't had a raw week (tho' there's still time and this is definitely the season for it). i've been riding my bike every chance i get (makes me buy groceries much more sensibly, i'll tell you), so i'm keeping that one pretty well. and making something every single day, if bread counts, i'm doing pretty well there. so speaking of making things, let's check in on the evidence of creativity. 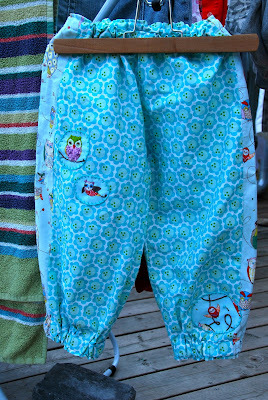 #57--i made these cheery capris for sabin. #58 - this embroidered patch covers up the hole. the color is more accurate on the two bottom pictures. the light was really strange on the shots of the pants. it was clouding up to rain. using pretty paper and scrabble tiles. i don't know yet what these things will be. so i won't give them numbers as of yet. I have to say, I think that is a serious amount of creativity! 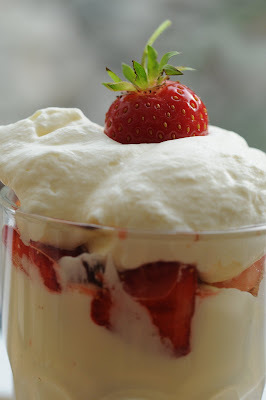 The creaming puddingy thing looks ah-mazing, and I LOVE your journal. and those little capris....OMG !! !....how adorable are they ? Now there you go, getting me all inspired to create and with so much to do today. It was this cheerful creativity of yours that drew me to MoPC in the first place. The bloomers are amazing and even better with the patches. Yeah Sabin! Is this an original design or did you use a pattern? (Interesting note: Sabine seems drawn to turquoise like her Mama. She was wearing it head to toe in your geocaching post). Your beautiful art journal is making me want to make one too, just not sure I would be as good as you at keeping up with the projects :) Keep it going and keep posting the results, might just give me the encouragement I need to do the same. Perhaps the Russian architects were inspired by chives. What a great blog name, don't you think? Inspired by Chives? Ahhhh, if only I cooked . . . Whenever I start to think that we could actually be related, you go all artsy and stuff. Although I wish I could do these things, it just doesn't happen. Paper and pencil for me (on a MacBook that is). And recently discovering to combine with camera. But that's it. Guess I am just a distant cousin who gets the rants and raves and wishes she could make pants and creative saves. my oohs and aahhs just kept getting bigger as i went through the pics. all so cool! LOVE those little necklaces! how do you do that? wow. as i was about to write my response i noticed your beautiful etsy rocks. they are truly beautiful. like small poems. and now back to this comment. i love your patches - more poetry. oh! My, that's really tough, you are an artist i should say! You have a lot of creativeness, your doing a very nice job. Very inspiring. Love those capris. A raw week is on my list of things to do as well. Did a raw week/juice fast a few years ago for a week and it was a great experience. I am joining Enviro Girl in wondering how you do ALL that and write and be a mother and etc and etc...I felt good that I wrote in my blog AND shaved me legs! I am inspired by you..I think creativity generates creativity! AGain, are there more hours in the day over there? How do you have the time to do all these wonderful things! You're so clever, I'm not jealous...oh no....the carpis are just gorgeous!